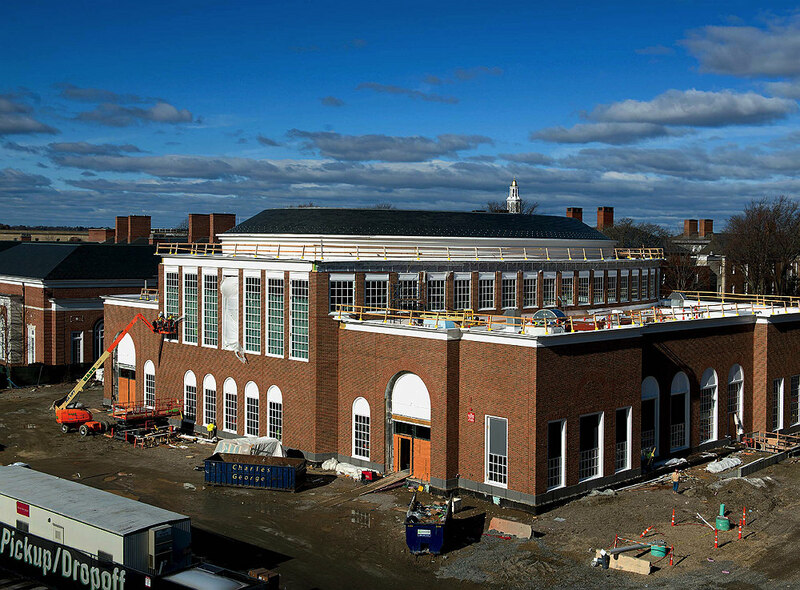 Klarman Construction: A mid January view of Klarman Hall, the new auditorium-conference-convening complex scheduled for completion later this year at Harvard Business School. The facility, which will replace Burden Hall and define a new campus quadrangle and roadway, can accommodate up to 1,000 people at a time: more than an entire M.B.A. class, for instance, or joint events with engineering and applied sciences professors and students, with whom HBS is already building academic and degree collaborations  in advance of completion of the new home for most of that school’s faculty, rising across Western Avenue and expected to open in 2020 . The eastern end of HBS’s campus will, upon completion, include not only Klarman, but also expanded and renovated executive-education quarters, consistent with the school’s aim of bringing together business leaders from around the world. Details about the new facility were reported at harvardmag.com/klarman-hall-16 .